Trucks like this have been busy with the recent snowfall. The blizzard that blew through Iowa this week was the snowiest storm the state’s experienced in nearly four decades. State Climatologist Harry Hillaker continues to crunch the numbers, but says it appears the statewide average snowfall between Monday and Wednesday was 10.2 inches. That’s the largest snowfall total from a single storm since early January of 1971. The storm of ’71 produced an average of 10.4 inches of snow. The biggest snowstorm to hit Iowa since 1950, at 14.3 inches, occurred in March 1951. 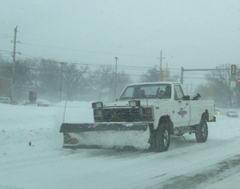 The last big winter storm in Iowa dropped 6.7 inches of snow statewide in March 2007. “The 2007 storm was probably more intense, where it was centered over the western third of Iowa. Places like Carroll and Harlan had about 18 inches of snow with that and wind gusts well over 50 miles per hour,” Hillaker said. The 2007 storm hit only half of the state, but stranded more motorists and closed roads for longer periods of time. Hillaker says all 99 counties in Iowa received snow in this week’s storm, with most counties getting six or more inches. The cities of Corning and Osceola may have been hit the hardest – both recorded 16.2 inches of snow. Hillaker says he measured 16.7 inches of snow outside his home located on Des Moines’ west side. In northeast Iowa, Strawberry Point reported 15.3 inches. Wind gusts of 40 miles per hour were common across the state. The strongest wind gust on Wednesday was recorded in Esterville at 61 miles per hour. “To say the least, this storm we just came through, ranks among the very largest ones we’ve had in Iowa’s history,” Hillaker said. This week’s storm ranks third on the list of top 10 snowfalls statewide since 1950. It’s the only storm on the list that occurred in December. In fact, it was a pre-winter storm. The first official day of winter is December 21.